On November 15 and 16, the World Refractories Association met at the Extraordinary General Assembly and Conference on Innovation in Beijing. 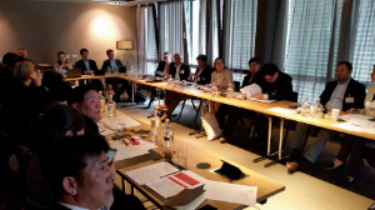 In addition to the representatives of the member companies, top-class experts met and discussed the future of the refractories industry for two days. For more information read our press release here. The Board of the World Refractories Association met on Thursday 12 April on the occasion of CERAMITEC in Munich, Germany. The new WRA President Stefan Borgas opened the meeting by presenting the future orientations and objectives of the World Refractories Association (see the inaugural letter). The WRA Board Meeting offered an opportunity to present the progress of the work developed by the WRA notably regarding statistics, customs codes revision and safety data collection. The next WRA Board and General Assembly will be organised on 15-16 November in Beijing in China followed by a WRA Innovation Conference. Brussels/Vienna, 16 January 2018 – Stefan Borgas, CEO of RHI Magnesita, was elected new president of the World Refractories Association (WRA) and took office in the first days of January this year. He will assume the presidency previously occupied by François Wanecq, former CEO of Vesuvius plc, for two years. Borgas and the RHI Magnesita delegation directed their gratitude to Mr. Wanecq for his work and dedication as inaugural president of the WRA and thanked the whole Vesuvius team for the seamless handover they facilitated together with the WRA secretariat. “It is a great honor and pleasure for me to chair our industry’s global association. I will continue with my team to work hard to further promote the interests of the refractory industry worldwide and expand its global network”, said Stefan Borgas. Besides strengthening the role of the association founded just in 2014 as a counterpart to other world industry and customers organizations such as the World Steel Association, Stefan Borgas strives to increase the number of WRA members to unite as many producers as possible. In a next conceptual step, local members’ interests and global sector issues will be aligned to create a generally recognized industry agenda. Among the obvious main issues, Mr. Borgas will put a special focus on innovation, safety and safety data collection and the tense global raw material situation driven by stricter environmental regulations in China as thematic priorities for his presidency in 2018. The next WRA Board Meeting will be held in the course of the CERAMITEC from April 10 – 13, 2018 in Munich, which is one of the leading international trade fairs within the industry and an annual meeting place for experts and decision-makers in refractories. To read the full press release, follow this link. The Second World Refractories Association General Assembly took place on 27 September in Santiago de Chile, in the context of the UNITECR 2017. The WRA General Assembly offered an opportunity to present the initial work developed by the WRA since the 1st General Assembly in Vienna in 2015 regarding statistics, customs codes revision and safety data collection. About 40 participants attended the event and exchanged on the future orientations and objectives of the World Refractories Association. The third WRA General Assembly will be organised in the context of UNITECR 2019 in Yokohama, Japan.